Looks like the Qubino uses a DS18B20 too - just in a different package. You could get the same package to use with Fibaro. IMO, the TO-92 package mounts to pipe better. I don’t see added value (for this application) here. … unless you are putting value in eliminating the battery. You would still need an enclosure. I would consider wiring a 3.6v DC power supply into the Fibaro to the same end. Can you do that? Wire 3.6v dc to the fibaro? Yeah, for me the advantage of wired power is realtime (or near) status. I have an aeotec multisensor 6 outside that I use to gather lux measurements and then set certain lights based on the outdoor conditions. Once I was able to wire this sensor I could send near realtime data and everything worked much more smoothly than with a 4 minute update resolution. My recirculation loop use case is a little different than yours. I’m looking to do an on demand loop with a dedicated return and no temp activated valve in the middle, so realtime temp data from the sensor at the other end is useful for shutting down the pump. Right now I’m just running it on a timer, but if I can get immediate temp data I can shut it down at a set temp at the far end. Not only is it 1/2 the price, it’s twice as fast. The gpm flow rate for the Watts pump, I just learned, is only 0-3.4GPM at 0-3.5 head. This is fine for a continuous recirculation solution, where you’re recirculating for a period of time in anticipation of user demand, but for an on demand application, speed of delivery after the motion trigger is important. Yes, if you aren’t afraid of a little more DIY activity. The battery is just a 3.6 volt DC power source in a 1/2 AA package. Google 3.6 volt DC power adapter. I suspect most any will do as I can’t imagine an extraordinary current need. Cut off the plug and connect to the battery terminals, observing polarity. There are many ways to do this: solder to board, clip to terminals, sandwich wired plates between dummy battery (e.g. wood dowel) and terminals. Google battery eliminator. It should be easy to cut a gap in the cover to route the wire. I have done such on one of these to expose the antenna. sweet! I’ve already ordered a qubino, but I suspect I can find a use for both, especially if they’re powered. Monitoring is a lot more useful when you don’t have to be stingy about power. I have a Qubino relay as well and it has been rock solid so you should enjoy it. Most of the Qubino mains powered devices support the extra temperature sensor, so you could use either the thermostat or just a simple relay switch with some extra logic. Keep in mind that you need to enable watt reporting on the thermostat via configuration parameters if you want real-time data from the device, since thermostate devices are a bit specific here when dealing with delta values. You could get quite a few z-wave transmission frames being sent on output activation, depending on how high the temperature and setpoint diferrences get. This is truly awesome! Thank you. First let me say thank you to everyone here for working on this issue. This is going to be my next project that I do with SmartThings and the community experience shared here is invaluable. In researching parts and what-not I found this little beauty. It uses the DS18B20 so it should simply be a matter of wiring the appropriate connections. Perhaps into one of those cheap Sonoff TH10s as per this thread. I’m also attracted to this pump. It’s a bit more expensive than the Bacoeng, but it looks right for my purposes (dedicated return line). My only concern would be physical support for the pump since all my plumbing is PEX, but I’m sure I can figure something out. Neat DS18B20 sensor package. I think that is more in line with what @wgmcg was looking for. I don’t know that it would perform any better than a TO-92 package but it would certainly look nicer. Brewers have all the toys! Be careful about mixing metals and galvanic corrosion. PEX and stainless steel should be fine. Sonoff vs. Fibaro seems be an integration headache vs. cost tradeoff. Flexibility vs. simplicity. Clunky vs. cute. Oh! That sensor is the sh*t!!! Yeah, looks like it’ll require a stainless female 1/2" pex barb, 1/2" npt, 1/2" pex barb fitting for my setup. I hope such a fitting exists. The little sonohff device is cool too. As for the pump? It looks pretty solid at a good price point, but what are you trying to achieve? The flow/head ratings look a little anemic for my purposes. Looks like about 3.5 GPM at 3 ft/head but maybe I’m reading the wrong chart. Are you trying to do a continuous loop or on demand? In my case I’m looking to heat and move water to the fixture in as short a time as possible. The bacoeng at the highest setting can get this done in 30 seconds or so. The Watts pump took more like 90 seconds with similar specs to the Laing. I found a tee and barb fittings in 316 stainless steel on Amazon. Can’t find it in 316 in less than packs of five. 304 would probably be fine, too, but why not go for the best? I’m going for an on-demand loop, so perhaps a more powerful pump would be more appropriate. @wgmcg I see the Watts pump says not to be used with tankless water heaters. Not sure why. You haven’t had any issues? I don’t have a tankless but want to upgrade to one once my heater fails. (We actually are supposed to replace them every 10 years or insurance will not cover any flood damage caused by them failing but very few people do or even know about the 10 year limit). Want to make sure I get a pump that will work with both a tank and tankless system or do tankless have pumps built in and not require a pump? 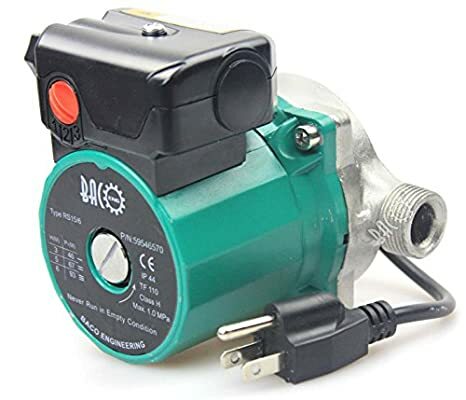 I returned the watts pump to amazon, but I did try it out with my tankless and it worked ok. Again, the flow rate was a little low for an on demand situation. I think they say not to use it with tankless for a couple of reasons. The first being that it may not have enough flow to trigger the tankless, though it worked ok in my case with my rheem. The second case is that as a timer based pump it could potentially cause your water heater to fire excessively. Most tankless water heaters do not include a recirc pump, though it is becoming more common to include one, or offer one as a field installed option. how loud is the BACOENG pump you got? you’d have to know what to listen for to know it’s on. What did you end up using for reading temperature? were there any issue (excess water flow/pressure) if someone turned on a tap while the pump was still running? For reading temp I’m still using the Fibaro FGK-101 with a ds18B20 glued to a section of copper pipe. I’ve bought the parts to replace the sensor with the BrewPi one mentioned above, but I haven’t installed it yet. One problem I’ve had with the Fibaro is that the batteries haven’t lasted well with the activity that the sensor is seeing, so along with installing the new sensor I’m going to hard wire the fibaro to usb power, also as mentioned somewhere above. I just have to find the time to do the project. The fact is the recirculator works fine without the temp sensor. I just have the pump run timed in my piston to run for 30 seconds at no less than 15m intervals when there’s motion in the bath. It’s slightly less efficient I suppose since the pump runs regardless of the water temp, but its really not that bad. I have a fuel stream that tracks the pump runs and it runs between 12-18 times per day for 30 seconds. So lets say 9 minutes/24h for nearly instant hot water every time? I use the 2 pistons above in the thread, plus I have another failsafe implemented as a smart ligthing app that turns the pump off if the “power allowance is exceeded” and its been running for 1m. My hope is this catches a condition where the pump is on and ST cloud goes down, since Smart Lighting, and my zwave switch both run locally, but I haven’t fully tested that either. As far as flow issues with the pump on, I haven’t seen any. I haven’t noticed any pressure differences with the pump on or off. approx 30 secs whenever the bathroom light is turned on. we always turn on the lights if using the shower/bath. will just put in a EcoNet EBV105 valve control. Whats the EcoNet valve for? To shutoff return to the cold water line when temp is reached?